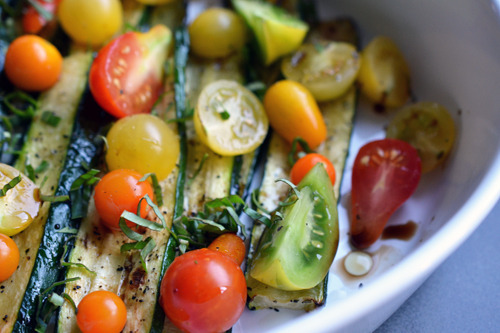 Broiling zucchini is my favorite (and easiest) way to prepare this humble vegetable. If you aren’t applying high heat to it (e.g. 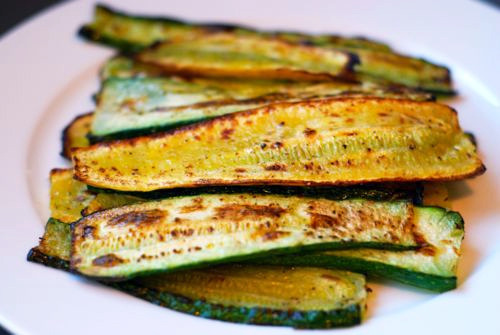 grilling or broiling), you normally end up with a soggy mess unless you salt the zucchini ahead of time. I don’t normally have the time or forethought to do that, so I just broil it in the oven for about 8-10 minutes. You can simply plate up the roasted slices and drizzle on some acid (vinegar or lemon juice) or you can use them in place of noodles. 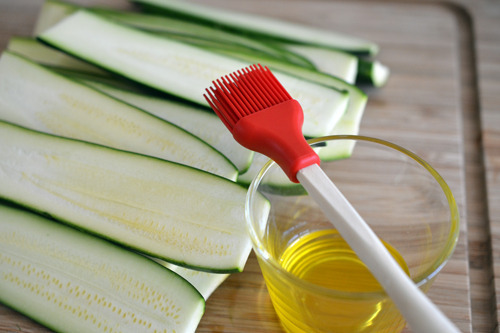 This dish is really tasty and a breeze to make – provided you have a mandoline or food processor. 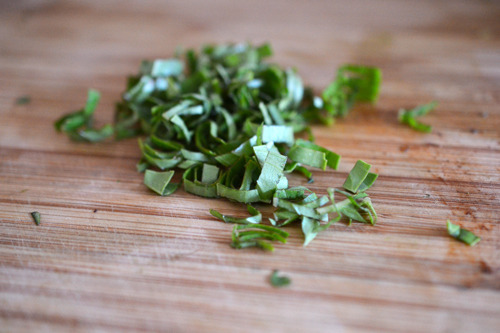 Otherwise, you better have some mad knife skillz or this dish won’t be worth the effort. 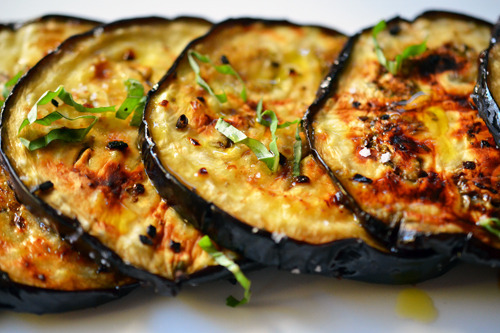 Psst…you can substitute the eggplant for zucchini and the results are just as good. I preheated the oven to broil and made sure the top rack is about 6 inches from the heating element. 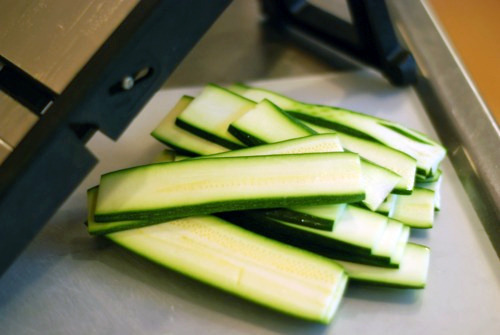 I thinly sliced the zucchini (¼ “ thick) using a mandoline slicer. No mandoline? Benriner makes a cheap one that my chef sister swears by. It’s important to have uniformly thick slices because otherwise it won’t brown evenly. I lined a baking sheet with aluminum foil. 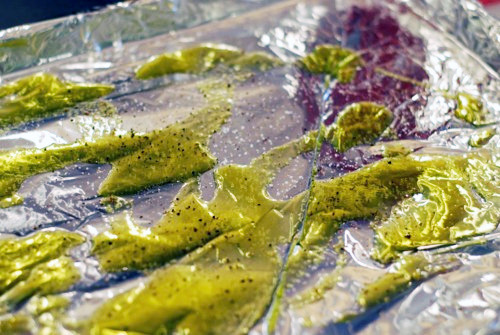 Then, I drizzled a generous amount of oil, salt, and pepper on the foil. 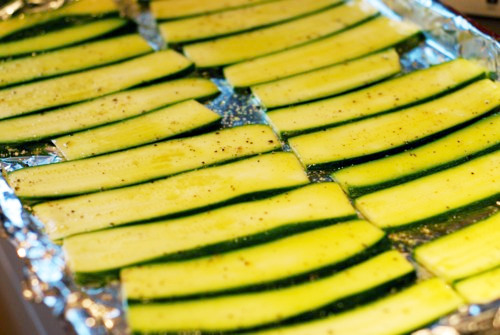 I spread the zucchini slices in a single layer on the baking sheet and flipped them over to make sure both sides were greased and seasoned. 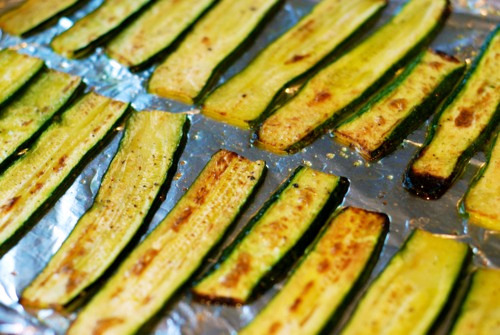 I seasoned the zucchini with some more salt and pepper, and placed the tray in the oven and broiled for about 8-10 minutes, flipping the slices and rotating the tray halfway through. 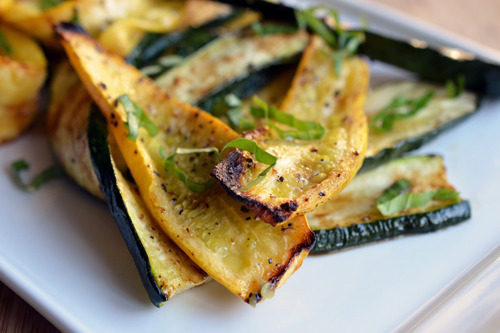 Watch the slices carefully because they can go from lightly browned to charcoal in about a minute. …and whatever else I feel like. Fast, tasty, and easy clean-up. I’m all over that!